I’ve just received a Smallart Uhost mini PC based on AllWinner A10 from the “The Cubies hacker shop” on Aliexpress. The device features 1GB RAM, 4B flash, includes 802.11 b/g/n built-in, USB ports, HDMI output and a microSD card. It costs $70 including shipping. I received the device in the simple package below. There is a whole bunch of stuffs inside the package. A USB to mini USB cable for power and to connect the device to PC to act as a USB drive, the Smallart U-host mini PC itself, a user manual in English, the power supply 5V/2A with a USB port, an HDMI female to male cable. The USB to mini USB cable has actually 2 large USB connector in order to provide up to 5W power (2 x 500mA x 5V). The mini PC has several connectors including an HDMI male connector, a USB Host port (for mouse/keyboard/wireless dongle), a mini USB device port (for power and USB drive function), a micro SD card slot, a microphone jack (although there is a built-in mic as well) and a “Ukey ” used to switch the mini PC function to USB flashdrive when connected to a PC. 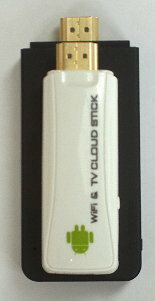 The HDMI Female to Male cable can be used for those who cannot plug the device directly into the TV, so you’ve got the best of both world with this TV stick. I just find the cable very short, so for most people who use it the device may just hang by the TV. As I opened the package I was surprised by the size of the Uhost. It looked rather big to me, but it’s probably because I just used CX-01 mini PC this week, and would I have received it one or two weeks earlier I would probably have wondered how they could fit all those features in such as small casing. The dimensions are 120mm x 50mm x 13mm. Since this is supposed to be an hackable device suitable for bootloader and kernel development, I opened it to see how difficult or easy it would be to access the serial port. First, you need to remove 2 screws on both side of the HDMI ports with a precision screw driver, open it with a screw driver, remove 4 screws holding the PCB, and I finally manage to release the PCB quite easily. You can see the serial port (marked with a red ellipse below) that can be used together with a TTL to USB debug board to access the board with Putty / minicom. This connector is not available on other mini PCs such as the MK802, and you have to do some soldering to connect the serial adapter. [Update: It appears this is not a serial port header, but instead a USB port to connect a 2.4 GHz wireless module (Thanks to deadhp1 for the tip). I’ve also tried it myself with the serial board and could only receive some random garbage]. The HDMI ESD protection components and AXP209 power supply chip are soldered on the board (not seen on this side), and this is not always available on lower cost AllWinner A10 mini PC. The lack of those components may damage the device and even your TV, but I have yet to read about this horror story where the TV HDMI port blew up. This will also affect the longevity of the device. Today, I won’t test the serial port console, and run Linux on the board, so let’s put this back together and play a bit with Android 4.0. Smallart Uhost can neatly connect to my TV just like the CX-01, and I connected the cable to the USB port of my TV. The device will start, but it will just reboot after a few seconds because there is not enough power. So you have to use the power adapter. This is inconvenient to me, so I just plugged the USB cable in 2 USB ports of the Mele A1000 STB (It’s sick I know :)) and the device works perfectly. I really like the Android home screen, the lower part with the icons is static, and the icons and widgets can be “installed” in the top part which you can swipe to access all the 5 screens like you would do with other Android devices. There are 6 icons: Apps, Download (i.e. Google Play…), Browser (but not Chromium for Android here despite the icon), Settings, Multimedia and File manager. If you don’t like that you can click on “ulauncher switch” to move to a full screen page with the 6 default icons and no apps, or “Return Home” to get the standard Android home. You’ll also notice a power button in the action bar. This can be used to Power and Reboot your device, which is a very useful option not available in (most) other mini PCs. This is not perfect however, as power supply is still provided to the USB port when the device is powered off. I assume this is an hardware design issue and can’t be solved by software. Going into the “About Device” section shows the model is U1A, but not much else. The “System updates” appears to only support OTA updates (TBC), and the “Developers Options” menu is present contrary to CX-01. I had no problem installing applications with Google Play such as ES File Manager Antutu, Quadrant, YouTube, etc.. and everything runs very smoothly and the firmware appears to be very stable. As usual Quadrant benchmark can be installed, started, but the benchmarks just won’t run. MPEG4 codec, AVI container – OK with “samplemedia: videos, but some other AVIs could not be played at all. VC1 codec (WMV) – Videos play just fine, but I could hear audio noise regularly (short time 1 seconds) during playback. WebM/VP8 – It can play but there are massive artifacts from time to time (like half of the screen filled with artifacts), and it’s not due to buffering. The good thing is that this device does not experience the buffering issues I had with CX-01 when playing “high bitrate” videos from SAMBA/CIFS (Windows Share). 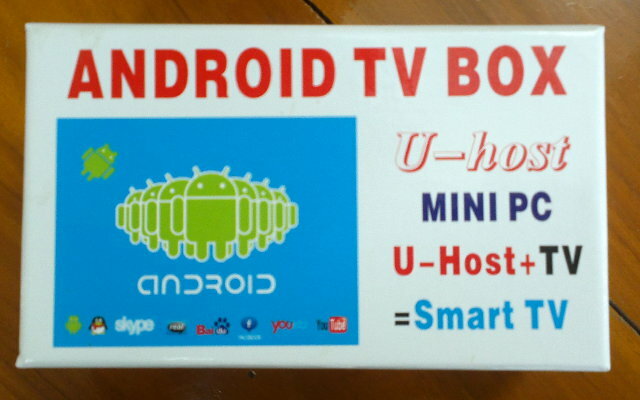 However, in terms of video supported, AllWinner A10 based solutions really lack in this field (not only the U-Host). Hopefully this is not related to the silicon, and can be fixed with better software. Maybe the XBMC implementation will help once it is available. Antutu benchmarks show the device is much faster than CX-01 mini PC (2216) and even Mele A1000 STB (2337) based on the same processor @ 1GHz (but running Android 2.3 at the time) using the same resolution 1280×720. I assume this is just because of improvement between Android 2.3 and Android 4.0. I could not find much interesting info in Quadrant, except it appears to always run at full speed (1GHz), and it indicates it can be clocked as low as 60 MHz. Even if it always run at full speed, this device does not appear to have overheating issues like the MK802. As with other A10 devices, you’ll be able to run Linux distributions (Ubuntu, Lubuntu, Xubuntu, Debian, Fedora…) by booting from a microSD card, or even replace to default firmware in Flash. In case you play with the NAND flash, and something goes wrong, I’ve been told we should be able to get the firmware file to recover, Smallart U-Host firmware is available for download. Smallart U-host is a stable device and offers good performance, and the only major drawback I can see for now, is its inability to play all sort of video files, but hopefully this can be solved in the future. There are also some minor downsides such A10 devices power consumption which is higher than others solutions like Telechips TCC8925, and the device casing is not the most beautiful. But if it’s going to be hidden behind the TV who cares? If you want to hack the device, and play with u-boot and kernel development, the Smallart U-host, together with the Mele A1000/A2000, is the best hackable device for AllWinner A10 I’ve seen due to the presence of the serial connector and easy opening. . [Update: It’s still possible to use the serial port, but this requires some soldering]. If so, you can subscribe to arm-netbook mailing list, chat on #arm-network irc channel and visit the developers’ resources on Rhombus Tech or the AllWinner A1X posts on this blog to get started. Smallart U-Host is available for $70 on Aliexpress. Remember you’ll also need to buy a USB to TLL debug board ($5). If you don’t have one yet, you can ask on Aliexpress (Tom), he will add one with the ribbon cable for free. As always, the USB to TTL debug board can be provided for the cnx-soft readers for free. Just leave a message on the order. “Developers Options” menu is present contrary to CX-01. Very nice review, saves me the effort to review the ovalelephant stick as it is exactly the same device. Will most likely send back some traffic mentioning it on my blog. (1) I was under the impression that the OE has headphone and mic jacks, which are very handy. I can’t find these jacks in the photes above; did I miss them, or is the U-Host = OE – (jacks)? I do like the ESD pretection and the power chip on the U-Host and OE. Thanks for bringing this device to our attention! Which wifi chipset is used on OE and U-Host? According to sao, it seems different from mk802? Is it right? First, a correction: It seems that the OE has input for mic, but no headphone jack. I’m pretty sure that the pins circled in red are NOT a serial port. I think it is onboard usb where the flymouse dongle is connected. I have seen pictures of the dongle connected to that area. I think the serial pads are on the other side directly opposite the a10 chip. The youtube website should load/play if you use firefox. I was able to load several flash video sites using firefox that I wasn’t able to load in the stock browser. Then again I have the Oval Elephant with android 4.04. I suggest trying MX player for video files. It supports hardware decoding of most of the listed formats. I thought only the 1st 10 pieces had an HMDI male port, and subsequent Oval Elephant mini PC would use a female port. The WiFi chip is Realtek RTL8192 like the Mele. Not sure about MK802. I think it’s not the first time you ask this type of question. Why is the WiFi chip used important to you? This is the only connector on the device, so it’s very likely it’s the serial port even though I haven’t tried it yet. I though the fly mouse dongle was just a standard USB dongle. The Oval Elephant is the same hardware as as the Smallart U-Host. I’ve tried MX Player and it’s better, because it appears to switch to software decoding when hardware decoding is not available. So what that means is that the videos that can play but have problems with other players, have exactly the same issues, but the videos that can not play at all with other media players, can play with MX Player (e.g. Real Media, MPEG2 codec / MPG container). However, when using software decoding, 1080p is very slow and audio is choppy at this resolution. It’s perfectly smooth for 480p videos. Well I’m going by pictures I’ve seen on the net. If you notice on the back towards the bottom of the board there are 4 pads that seem to be directly on the opposite side of the a10 soc. So going by that I’m guessing that the 4 pins are for an internal usb port. I will be testing this soon by attempting to hook up my wireless keyboard/mouse to it. Maybe it’s just different versions of software, but on my Oval Elephant I am able to play m2ts files in the stock player without a problem. I can’t play any avi files unless I use software mode in MX Player. I actually find the male HDMI port to be a problem as it doesn’t fit in the space my tv allows. I am solving it by purchasing a $3 HDMI Female/Female gender adapter. Thanks for that. I’ve tried it myself, and I only get some random output (and very little data). I’ve tried several uart speed with the same result. I’ve updated my post, and I’ll check with Tom to confirm. Concerning video, there are many small difference between files, so it’s possible your M2TS files worked but not mine, or it could simply be a codec issue for the particular file i tried. 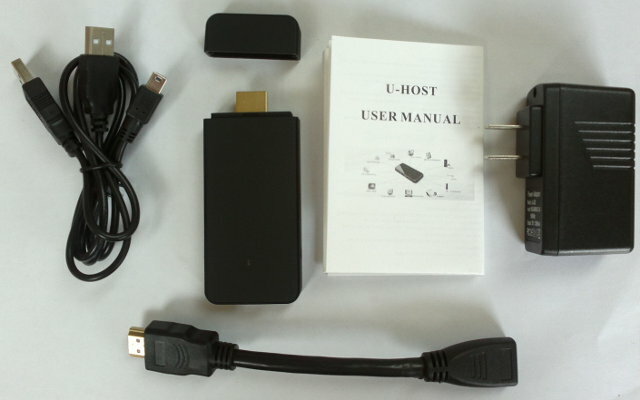 The U-Host shipped with a male to female HDMI cable, but it may have been missing with the Oval Elephant, or it may be too short for your needs. Indeed tne 4 pins are not UART but some sort of USB. We will need to investigate if we can alter the script.fex to “make” it a UART. I suppose it’s the same. Does it play OnlineTVRecoder AVI files?